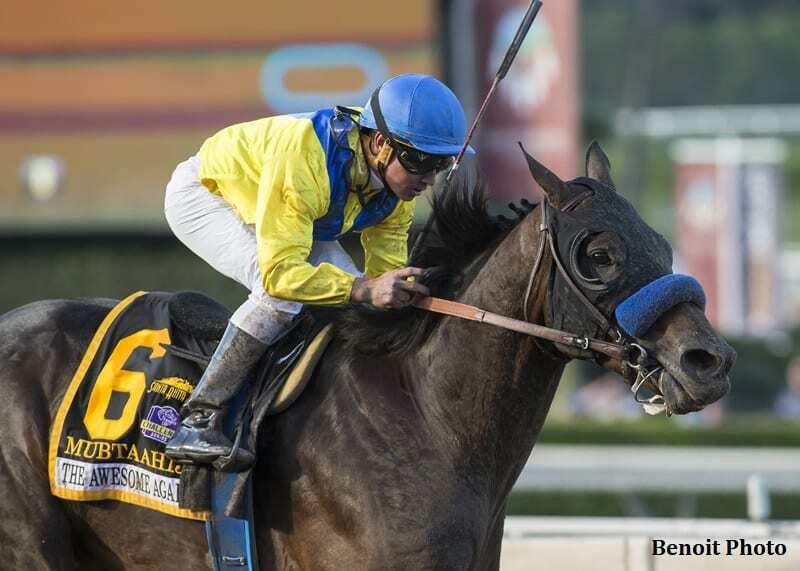 Mubtaahij (Drayden Van Dyke) - Awesome Again S.
Mubtaahij, a graded stakes winner in the U.S. and U.A.E., has been retired from racing and will likely begin his stallion career in Argentina, BloodHorse reports. The 7-year-old son of Dubawi is currently residing at Hill 'n' Dale Farms in Lexington, Ky., while his stud plans are finalized. Bloodstock agent Donato Lanni told BloodHorse's Jeremy Balan that interest in standing Mubtaahij in North America was “bleak,” but he implied that a fast start in the Southern Hemisphere could open the door for a return stateside. Mubtaahij retired with five wins in 24 starts for earnings of $5,780,332. Racing for owner Sheikh Mohammed bin Khalifa al Maktoum, he initially gained prominence racing in the U.A.E., winning the Group 2 U.A.E. Derby under trainer Mike de Kock and securing his place in the 2015 Kentucky Derby. He finished eighth in the Derby behind American Pharoah, and remained in the U.S. to run in that year's Belmont Stakes, where he ran fourth. The horse returned to the U.A.E. for a winter campaign highlighted by a second in the Dubai World Cup. He was then put in the U.S. barn of trainer Kiaran McLaughlin, where his three domestic starts included a runner-up effort in the G1 Woodward Stakes. Mubtaahij ran a similar circuit in 2017, running fourth in the Dubai World Cup, but moving to the west coast with trainer Bob Baffert for the summer and fall. Mubtaahij saw his greatest U.S. success under Baffert, winning the G1 Awesome Again Stakes, and finishing in the money in four additional graded stakes races in the U.S. He made one final trip to the U.A.E. for the 2018 Dubai World Cup, where he finished third. Mubtaahij was bred in Ireland by Dunmore Stud, out of the Pennekamp mare Pennegale. This entry was posted in Bloodstock and tagged Argentina, Bob Baffert, Donato Lanni, mubtaahij, sheikh mohammed bin khalifa al maktoum, Stallion Retirements by Paulick Report Staff. Bookmark the permalink.